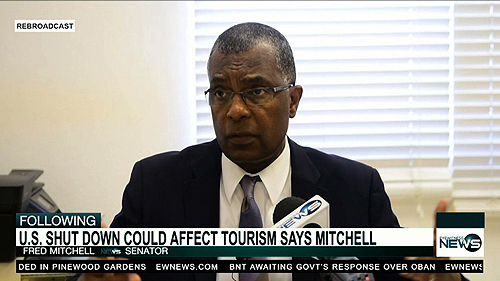 NASSAU, BAHAMAS – As federal government entities in the United States (U.S.)remain in shutdown mode, the Progressive Liberal Party’s (PLP’s) Shadow Minister of Foreign Affairs, Senator Fred Mitchell, on Tuesday spoke of the possible ramifications that the shutdown would have for The Bahamas. The US government’s shutdown was the result of a dispute in which United States president Donald Trump sought to allocate $5.7 billion dollars to build a wall to separate the United States and Mexico as promised during his campaign trail. U.S. Congress officials are adamant about not allocating the funds for such an extensive project, hence the government has shut down, forcing the closure of non-essential discretionary federal programs. As of January 15, 2019, the shutdown was in its 25th day and had surpassed the 21-day shutdown of 1995–1996, to become the longest federal government shutdown in U.S. history.